Round two. A town hall debate. John McCain, the self-proclaimed maverick, was planning to seize the moment and change the dimensions of the game. By now, his democratic opponent, Barack Obama, is doing a victory dance. If only the 72-year-old Republican received half the praise his inexperience VP running mate did following her debate, he'd be in good shape. Instead, even FOX News channel was coming up empty on compliments. Both candidates spent 90 minutes repeating their campaign positions, leaving viewers to judge on style rather than substance. McCain – the underdog trailing in the polls – paced around the room most of the time as he answered questions from undecided voters. At one point the erratic pacing led the Republican in front of the teleprompter, blocking the moderator’s view. Regarding foreign policy, McCain said the U.S. President should “talk softly and carry a big stick.” I guess this rule doesn't apply to Iran, North Korea and Russia. In that case, should the U.S. be penalised for spreading financial viruses throughout the global economy? Or how about waging a unilateral war in Iraq where one point two million civilians have reportedly been killed…any consequence for that? McCain reiterated his “KGB” reference against Prime Minister Vladimir Putin for the hundredth time and then said the U.S. needs to deal with Russia moving forward. Huh? I guess this is the “talk soft – big stick” tactic. Note to McCain: have a diplomatic back up plan if this once leads you nowhere. 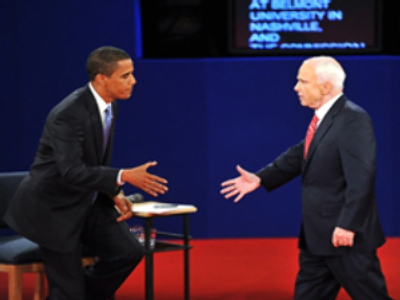 McCain did come across as more confident and personal in the second of the three Presidential debates. But clearly not enough considering early polls showed Obama trumping McCain 60% – 28%. Oh yeah…Obama – the other guy. I make nearly no mention of the democratic candidate because this wasn't his fight to lose. It was McCain's. The Republican had a 90-minute window to resurrect his campaign. Or at least sucker punch his opponent. In the end McCain, has less of a commanding physical presence and a more obvious level of frustration and anger. This was supposed to be John McCain's night to win over American voters. Millions of people desperately looking for leadership as they face a bleak future. Americans are looking for compassion, reassurance, and confidence. And when the debate was over it was John McCain who left the auditorium first, while Barack Obama stayed, shaking hands and talking to so-called undecided voters, who by now may have made a decision.